Yes, James. I was on the phone with you when those seeming alien antennas we rising up from behind your visor. You scared the snot out of me. I thought you were in a life threatening situation or at the very least were in the process of avoiding a head-on collision with a Mack truck. I’m glad you can relax and enjoy your shooting expeditions once you start. Funny, I know how much you hate creepie crawlies…I’ve seen your reaction in person when “a spider is staring you down and thinking of his dinner”. I never really stopped to wonder how you deal with it “in the wild”. Now I know…interesting. Those are would-be monarch butterflies – they kind that migrate from Mexico to Canada. 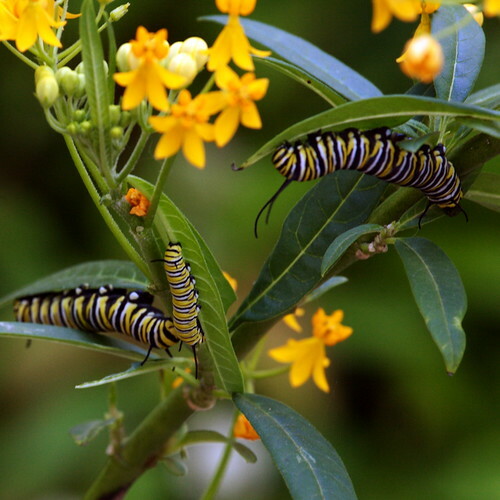 I know this because I recently helped to raise some that ate two whole milkweed plants down to their stems and then formed chrysalises from surrounding plants that were intact. I hope they found their way.